Phillip Henninger House. Built in 1842, it is listed on the National Register of Historic Places. 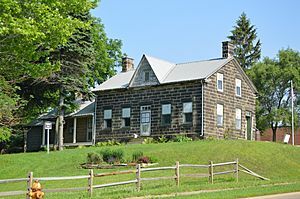 A stone house, built in 1849 and known as the Henninger House, was occupied by several generations of Henningers and is still standing today. 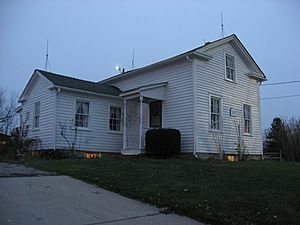 The house rests on one of the higher points in Cuyahoga County, which provided visibility for the entire northeastern part of Parma Township. This was also the same site where the Erie Indians, centuries before, stood to read and send fire signals as well as pray to their spirits. By 1850, the US census listed Parma Township's population at 1,329. However, the rising population of the township had slowed over the decades. The Civil War affected Parma much as it did other towns and villages in the nation. Three out of four homes sent a father, sons, or sometimes both, to fight in the war. By 1910, the population of the township had increased to 1,631. "A main reason for establishing the village of Parma Heights was to get a town marshal...There is one saloon in the territory...some pretty rough crowds Sundays have disturbed the quiet of the neighborhood...wanted it closed on Sundays. To do this they wished a town marshal. They couldn't have a town marshal without becoming a village, so they became one." 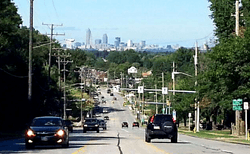 Today, Parma's population has reached 81,601, though it remains one of the Cleveland area's top three destinations young adults (aged 22 to 34) are increasingly choosing as a place to live, along with Lakewood and downtown Cleveland and was recently recognized by Businessweek as one of the best places to raise kids in Ohio. Parma is located at (41.391852, -81.728502). According to the United States Census Bureau, the city has a total area of 20.07 square miles (51.98 km2), of which 20.02 square miles (51.85 km2) is land and 0.05 square miles (0.13 km2) is water. Henninger House, built in 1849 and the oldest standing home in Parma, is planned to be part of the proposed Quarry Creek Historic District. As of the 2010 United States Census, there were 81,601 people, 34,489 households, and 21,646 families residing in the city. The population density was 4,076.0 inhabitants per square mile (1,573.8/km2). There were 36,608 housing units at an average density of 1,828.6 per square mile (706.0/km2). The racial makeup of the city was 93.0% White, 2.3% African American, 0.2% Native American, 1.9% Asian, 1.0% from other races, and 1.6% from two or more races. Hispanic or Latino of any race were 3.6% of the population. According to the 2010 Census., 22.5% were of German ancestry, 17.6% Polish, 14.8% Italian, 13.8% Irish, 7.4% Slovak, 6.7% English, 5.3% Ukrainian, 2.6% French, 2.2% Serbian, 1.9% Czech, 1.4% Arab, and 1.2% of Croatian, Lithuanian, or Russian ancestries. In regard to languages spoken, 87.03% spoke English, 2.26% Ukrainian, 1.68% Polish, 1.27% Spanish, 1.24% German, and 1.18% Italian as their first language. In 2014, Parma ranked as the third safest city in the United States with a population of 25,000 or more by Neighborhood Scout. In the updated list for 2015 and 2016, Parma is no longer listed in the top 100. In 2014, Parma had a crime index of 90 meaning it was safer than 90% of cities in the United States. By 2016, the crime index is 50% meaning Parma is only safer than 50% of cities in the United States. Also, Pearl Road (U.S. Route 42) runs from southwest to northeast through northern Parma for less than two miles (3 km). I handed her my radishes and pledged my love that night. We can't get together in the warm light of the sun. Parma, Ohio Facts for Kids. Kiddle Encyclopedia.